John McLean and a fellow caver walk along a massive mineral formation in Fort Stanton Cave in southwestern New Mexico during an expedition in early July. 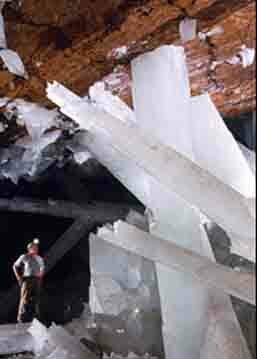 The odd formation called Snowy River is actually an intricate crust of tiny calcite crystals and spans a distance of at least four miles (six kilometers), although the exact length is still unknown. The surveyors from the Fort Stanton Cave Study Project added several thousand feet to the measurement. Last summer, explorers were surprised to find Snowy River flowing with water for several months. 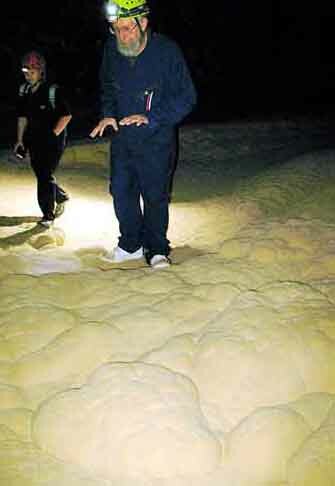 It had been dry when first discovered in 2001 and during trips in 2003 and 2005. 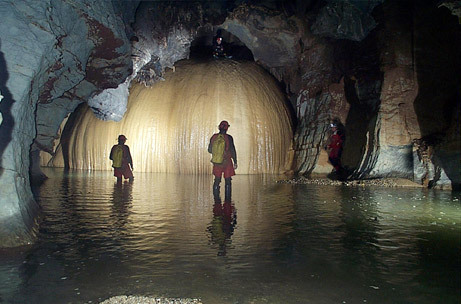 Some scientists believe innumerable floods in the cave built the formation over time, dropping a thin layer of calcite with each overflow. The few who have walked on the formation say they've seen nothing else like it. Already some three dozen species of microbes previously unknown to science have been uncovered here. Snowy River puts the already spectacular cave "in the class of world-class caves," said McLean, a retired hydrologist and member of the cave study group.